Samsung, a major Smartphone manufacturing company will always work on future devices for giving better user experience. Galaxy S9 plus is also the latest smartphone from Samsung which will be available soon in the market. As we have seen the performance of Galaxy S8, the new device will also be the best in performance. The chipset runs on the latest Qualcomm Snapdragon 845 that will be highly efficient in running the device while consuming minimal power. Besides the best processor the phone host other advanced features like dual tone LED flash cameras, enhanced internal memory, fast charging technology, super performance and latest operating system are some of the phone highlights. In design and display, it is going to be the most amazing phone ever. It is a slim and lightweight device with all advanced features. It has a bezel-less screen of 6.2 inches Super AMOLED capacitive touchscreen display, which is famous for high contrast and ultra-low power consumption. The screen is also be protected by the Corning Gorilla Glass 5. It has 3D Touch technology with a resolution of 1440 x 2960 pixels and enables 16 million colours. High pixel density will enable the device to produce sharp and crisp images, videos and will make all text easier to read. The fingerprint sensor at the rear gives the biometric security and a beautiful look to the device. A 3.5mm audio jack will enable the user to use speakers, headphone and other audio devices. The speaker is placed at the bottom. Regarding the performance, this phone is expected to offer better performance. It runs on the latest Android v8.0 Oreo. It is powered by the Qualcomm Snapdragon 845 processor that will offer smoother performance and is paired up with the Adreno 630 GPU. The processor is designed to optimize the phone’s performance by 10% to 15% for less power consumption, compared to the Snapdragon 835 chipset. It has 6GB RAM coupled with 64/128/256GB of ROM. Besides this, one of the sim slots can be used for a MicroSD card to extend the internal memory. This memory space will help users to store more data and install more applications. 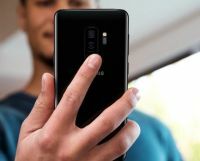 In today’s times, camera has become the main feature and selling point of the phones and Samsung phones are always equipped with good quality cameras. The camera is of 12MP and the front camera is of 8MP. The rear camera has a dual tone LED flash and a f/1.8 aperture lens for sharp and crisp images. The cameras host all the advanced features like phase detection autofocus, digital zoom, Geo-tagging, touch focus, face detection, High Dynamic Range mode, panorama. The high resolution cameras will help in taking clear photos as well shooting good videos. It is able to record videos at 2160p@60fps, 1080p@240fps, 720p@960fps and the curved HD display will play videos very clearly. The phone has the ability to play all standard audio and video file formats like MP3, WAV, eAAC+, FLAC etc. All the messaging services like MMS, E-mail etc.are also be supported. The phone has a non-removable 3500mAh battery with the facility of fast charging feature. As we are expecting the phone to consume 15% less power to run the device, this battery will be more than enough to use the phone for longer durations. The phone is loaded with all the possible sensors like Light Sensor, Proximity Sensor, Accelerometer, fingerprint sensor, iris scanner etc. 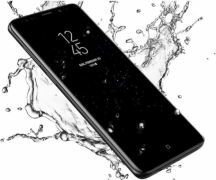 The Galaxy S9 Plus will be certified to IP68 waterproofing standards. The phone supports all 2G/EDGE/GPRS, 3G/HSPA/HSPA+ and 4G/LTE/VoLTE network bands. It also supports the other connectivity features like WiFi 802.11 a/b/g/n /ac, Bluetooth v4.2, GPS, USB-C v1.0 etc. that will enable a user to connect to wireless accessories as well as PC. Support for all network bands.